Back when we launched OTH, I can recall debating whether or not Day of the Dead should be designated an unsung treasure or enshrined in our Hall of Fame, which perhaps speaks to just how far its reputation has come in five years. At the time, the tide was turning (or had perhaps just turned) in its favor, as it often felt like the also-ran of the (then) trilogy of Romero’s Dead series. Now, there’s little doubt that it stands sturdily alongside Night and Dawn, even if it is the most alienating of Romero’s zombie films. For one thing, Day of the Dead is remarkably bleak, especially within the context of the 80s; where some pop culture and nostalgia have crystalized that era as an essentially harmless, neon-clad decade of admirable excess, Romero sensed something sinister resting in the hangover from the 70s. The shadow of Vietnam especially loomed large, which likely explains his decision to turn his satirical fangs towards the American military-industrial complex here. In typical Romero fashion, it’s pretty unsubtle stuff: here you have a military force that refuses to relent even in the face of certain doom. That its representative (Joseph Pilato’s Captain Rhodes) is a reprehensible sociopath highlights the folly and undercuts whatever nobility the endeavor might entail. In the tradition, the military squares off against science, and Day of the Dead follows suit; however, neither side is especially sympathetic, as the latter is headed by an eccentric madman who has taken to experimenting on the undead. In fact, one might argue that one of Dr. “Frankenstein” Logan’s (Richard Liberty) guinea pigs, Bub (Sherman Howard), is the most sympathetic and likable character in the bunch. Sure, there are some casualties (such as Lori Cardille’s Sarah Bowman) caught in the middle that are comparatively sane and level-headed, but even they’re reduced to eking out a meaningless existence at the end. Living out the rest of your days on a tropical island secluded from the zombie apocalypse feels like a victory until you consider that crossing those days off of a calendar is a fruitless attempt to bring a non-existent order to a chaos that’s still prevalent—no one actually accomplishes much in Day of the Dead, a film that captures Romero at his most pessimistic. Even Dawn ended on a bombastic, action-movie note that suggested hope might lay ahead in the future once Fran and Peter flew off to parts unknown (an act that pointedly occurs after the latter contemplates but refuses to commit suicide). Underneath the doom and gloom rests a nasty horror film that operates even without its historical context; again, the film just feels downright grim, as Tom Savini’s masterful effects work feel like punishments to the human flesh. Rhodes’s disembowelment (which has since inspired countless imitators) is symptomatic of Romero’s disdain for humanity—sure, it might be disgusting, but it’s a sequence that almost begs viewers to revel in the craftsmanship rather than feel any sort of empathy. Instead, there’s only an unnerving detachment—no one should mourn the characters in Day of the Dead, especially since they can hardly be considered to be alive in the first place. To cement the film’s legacy, Scream Factory has graced it with another stellar Collector’s Edition release that stands as an upgrade to Anchor Bay’s 2007 effort. For starters, the newly remastered transfer is an improvement, particularly in terms of detail; secondly, the disc only features the film’s original mono mix, but it’s presented in lossless quality and doesn’t suffer from the minor editing issues from Anchor Bay’s surround mixes. I’ve said this a lot lately in regards to Scream Factory releases, but it again stands true: Day of the Dead has never looked or sounded better on home video. And if that weren’t enough, it’s never been treated to such a wealth of special features. Scream ports over most of the stuff from Anchor Bay’s release, including the neat ad for the Wampum Mines and all of the film’s promo material (trailers, TV spots, photo galleries, etc.). Both commentaries return: one features filmmaker Roger Avary, while the other joins Romero, Savini, Cardille, and production designer Cletus Anderson). Savini’s vintage behind-the-scenes footage is also back here. The only major omission is “The Many Days of Day of the Dead,” which his easy to swallow considering Scream has produced its own retrospective documentary that’s almost as long as the film itself. 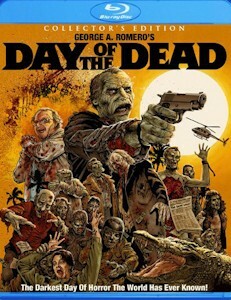 It’s a fascinating look that tackles not only Day of the Dead but also its legacy within the context of Romero’s work. Everyone from Romero himself to just about anyone who appeared in or worked on the film is featured for new interviews and anecdotes; fans have no doubt grown accustomed to Scream’s fine work on these retrospectives, but this may be its best effort yet. It’s even tacked on another featurette that takes viewers back to the mines as they stand today. Considering Anchor Bay’s already lavish treatment, I’m not sure if Day of the Dead really jumped out as a title that begged for an upgrade, but Scream has quelled such doubts. The feature-length documentary alone is worthwhile, and the improved presentation makes it even easier to take a second bite.